It is a pleasure to welcome singer-songwriter Matt LeGrand to Jake’s Take. The Chicago native grew up surrounded by a lot of musical inspirations, and throughout his musical journey, Matt LeGrand experimented with various instruments such as the guitar and drums. He also dabbled in recording musical genres. Matt’s talent caught the attention of his manager, Bryant Reid, who developed superstars Usher and Toni Braxton. Recently, Matt released his latest single, “12:00 AM,” which will he debut at EMPKT PR’s Get Ready to EMPKT event in New York City on Wednesday, July 25. The red-carpet event will celebrate the launch of the rising public relations agency. Before he took the stage, Matt LeGrand exclusively spoke with Jake’s Take. He talked about overcoming the challenges he faced in the music industry, mentioned which rock legends inspired him to perform, “12:00 AM,” and previewed his New York City debut. Jacob Elyachar: When did you get interested in music? How did that passion evolve into the desire to pursue a career in the recording industry? Matt LeGrand: When I was 11-years-old, my mom took me to my very first concert which was a Rolling Stones concert. The Rolling Stones was her favorite band, and I grew up listening to a lot of classic rock. When I saw the Stones on stage, I ultimately fell in love with not only the music but the idea of going on stage and being able to tell a story on a massive scale as they did. I ultimately fell in love with the idea, and that is when my mom got me my first guitar. I picked that thing up, and I haven’t dropped it since. Jacob Elyachar: Who are the artists that inspired you as a performer? What they made on your career so far? Matt LeGrand: Freddie Mercury is my most significant influence and is the person that I look up to the most vocally. Not a lot of people know this, but he was trained in opera for 11 years. My vocal teacher is an opera teacher, so I almost feel like I am taking the same path as him and that is a good feeling. To be able to do what he did four to five nights a week and the power that he gave every single show by giving everything he had to his audience. He blows my mind every time I see a video of him. I wish I could have seen him live, but I am very excited for the movie [the upcoming Bohemian Rhapsody] that I believe is coming out in November. I also admire Coldplay’s Chris Martin, Bono from U2, and Ed Sheeran. I look not only how they are as musicians and how they are on stage, but how are they off stage. I look into what they do in their personal lives, that is what speaks to me. Jacob Elyachar: Could you please describe your songwriting process to my readers? Matt LeGrand: I always start writing songs with the acoustic guitar. It usually starts out with a riff or a chord progression, whatever speaks to me. I also begin humming melodies in my head. If you are not humming melodies in your head or going along with any instrument that you are playing, it is very hard. Songwriters should let it all out and see if something sticks. Make sure that you are putting it on Voice Memos on your phone. Things go a thousand miles per hour in your head, so you want to make sure that you grab that melody even if it is something not right. I am always recording Voice Memos. I will start humming along and all of the sudden you have something that you want to talk about. For me, it is usually a word or sentence. This last song I just wrote “Strange Affair.” When I was writing the song, I do not know how those two words came into my mind. I looked up what “Strange Affair” was, and I determined that it focused on a strange relationship. I started writing sentences that did not make sense. It is like a puzzle; you have to find what fits. If it does not fit, you need to take it out. Sometimes, songwriting could be a very frustrating process for me. [Laughs] But once I figure out what I want to talk about and once the message is clear, it is very rewarding. Jacob Elyachar: What are some of the most significant challenges that you faced as you try to break out into the music industry? How did you overcome those obstacles? Matt LeGrand: I think a significant challenge is finding out who you are personally and as an artist. It is extremely hard in today’s society, where there is so much judgment. Although social media is fantastic and it allows us to connect, it has caused a lot of pain. It caused so much judgment where they claim that people have to fit a specific mold. There is no mold! We should be able to express ourselves how we want to, and that is one of the most significant challenges is getting over those judgments. One of the best things you can do is surround yourself with positive, supportive people because you are going to go through a lot of mental battles on the journey of finding yourself as an artist. If you see some fixed or grounding point that you could come back to, no matter how far sideways you go, you could always go back to that point. For me, it is my faith. I can still go back to it and know that I am safe there. I am safe in that realm, and it allows me to then grow out of my comfort zone. That is how I overcome my challenges by just keeping the faith. There are four things that I like to spread which is light, love, peace and joy. 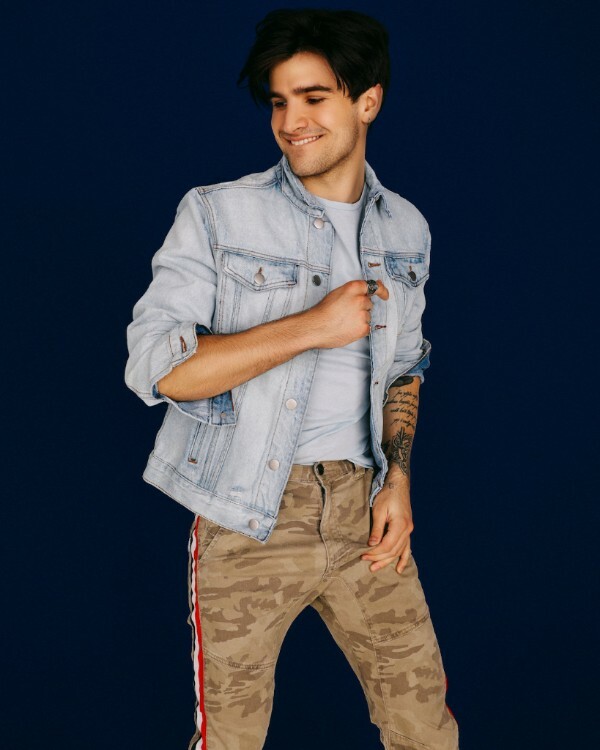 Jacob Elyachar: A lot of artists from our generation have turned to American Idol, America’s Got Talent, The Four: Battle for Stardom, and The Voice to kickstart their music career. Have you thought about auditioning for those shows? Why or why not? Matt LeGrand: Those TV shows are phenomenal! The opportunities that they give to artists are amazing. They put them on a pedestal and showcase their talent amazingly. For me, that was not a path that I took. I took a different direction, and I am so happy where I am today, but I love those shows! As an artist, it is very helpful to see those artists who serve as judges take in the talent and viewers see that care, plus it is very nice to see these artists have their shot at success. Jacob Elyachar: Let’s talk about your new single: “12:00 AM.” What is the story behind the song? Matt LeGrand: The song is based off the questions: “What would you do if you only had one hour to see your loved one every 24 hours?” and “How would you spend the minutes?” That is what this song is for me. At 12 a.m., I get to see her, and we are going out to do everything with that person that lifts you to another level. We are going to experience new things and forget about our problems. That is what “12:00 AM” is about. It is a fun, energetic, and uplifting song that always brings me to that level and I hope it can carry my audience there as well. Jacob Elyachar: On Wednesday, July 25, you will premiere “12:00 AM” at the EMPKT Public Relations event in New York City. What can the events’ attendees expect from your performance? Matt LeGrand: There is no other place in the world like New York City. Over the past couple of months, I have been in the city to do some work. Last week, I was here with my family, and I was able to see a lot of the town. Every single time I come to New York City, there is always something new to explore. I am incredibly excited to be doing the debut here and for EMPKT Public Relations. They took me in and gave me the blessing to perform the song at their event. The event’s attendees can expect a lot of fun and positivity. Jacob Elyachar: If you had the chance to meet with aspiring performers who want to enter the recording industry, what advice would you share with them? Matt LeGrand: Hard work and be nice to people. Treat people with respect and do not give up! It is exciting because it [music] starts as a passion, it starts as a hobby. But, when you want to make it your career, you are going to have to struggle because this thing that brought excitement and joy that was a hobby is all of the sudden your work. The question becomes “How can you separate the two? Can you still find happiness and joy in music before it became your work?” For me, it got to a point where it felt like work. It will feel like work at times, but you need to find the balance between the two and still do it because you like doing it. I still love sitting in my hotel room, where I would pick up my guitar and sing a song. If I am not on camera or do not have to do it, I still enjoy it. It is a very interesting path to take, but I believe that you guys can do it. If you are in the New York City area and want to attend the event, visit EMPKT PR’s website! To connect with Matt on social media, visit his Facebook, Instagram, Twitter, & YouTube channels.